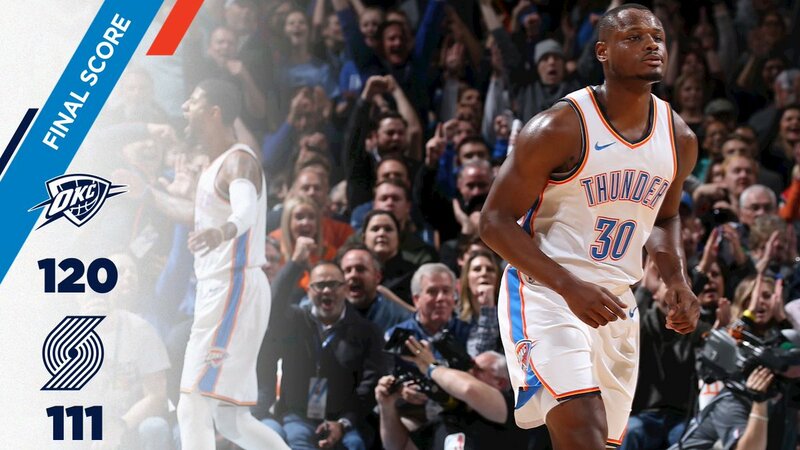 Oklahoma City beat the Portland Trail Blazers 120-111 in the regular season of the NBA 2018-19 at the Chase Peak Energy Arena in Oklahoma City, Oklahoma. Oklahoma City won four consecutive wins, kept third place in the Western Conference and Portland, ranked fourth in the Western Conference (33-23), lost two straight. Russell Westbrook, a triple double machine, was the same. Westbrook had 21 points, 14 rebounds, 11 assists, and 1 steal in a double-block shot to triple-double with George. Russell Westbrook made the triple-double in 10 consecutive games and became the star of the NBA's first ever record, The previous record was nine games set up by Westbrook and one of the NBA legendary players, Wilt Chamberlain, in 1968. Oklahoma City was completely dominated by the first half. Paul George fired at length. After 17 points in the first quarter, he scored eight points in the second quarter. In the second quarter, Raymond Felton and Deonte Burton came out of the bench. Oklahoma City was 68-49, 19 points ahead of the first half. In the third quarter Portland is on the chase. Portland got up to 13 points with Damian Lillard. Oklahoma City was a different offense from the first half. The shooting rate was only 21.7 percent. Oklahoma City is back in the fourth quarter. The basketball team ran with solid defense and pulled up momentum. Portland did not lose strength either. Lillard and CJ McCollum were chasing after scores of other players. Oklahoma City did not have enough time left. With Westbrook's three-point shoot-out at the end of the game, Portland could not pull any more power. The victor was George. George scored 47 points, 12 rebounds, 10 assists and 2 steals in 3P 8/13. Russell Westbrook had 21 points, 14 rebounds and 11 assists in 10 consecutive triple doubles. He also dazzled the presence of Deonte Burton who was active in KBL's Wonju DB. I got off the bench and I got the energy on both sides with 18 points in 26 minutes and 2 blocks FG 7/9. Deonte Burton, who entered the US professional basketball (NBA) stage after playing for the KBL Wonju DB program last season, scored the most points in one game. After working on the DB for last season and signing a two-way deal with Oklahoma City, Burton, who has been on the NBA stage for the past two seasons, is on the verge of expanding his position as a replacement. He scored an average of 2.7 points in 18 games.